During the summer, top international researchers and young scientists gathered in Lindau. Every year since 1951, this historic city on the shores of Lake Constance has been host to a meeting of Nobel Laureates, and this year the focus was on chemistry. The "63rd Lindau Nobel Laureate Meeting" brought together 34 Nobel Prize winners and more than 600 undergraduate and postgraduate students from 78 countries, all of whom had travelled to Lindau to share their knowledge in lectures, discussions and master classes with the highly experienced researchers. The media equipment and support for the events, which were held in various locations from the "Landratsamt" county hall to the town's theatre, were provided, among others, by Baas Film GmbH. The company's managing director Mihály Baas reported: "We set up an event stage and other equipment at the Lindau Inselhalle. However, what was particularly demanding from a technical point of view was providing the media equipment and support for the decentralised event venues, particularly with regard to photographic, audio and video equipment. For example, at the "Science Breakfasts" in the Forum am See conference centre, up to eight handheld transmitters and eight headsets were in use every day." For the mobile PA systems, Mihály Baas and his colleagues used the new LSP 500 PRO from the Sennheiser product portfolio for the first time. Four LSP 500 PRO loudspeakers were in action, often operating in master/slave mode. The master speaker was equipped with two network-capable Sennheiser EM 300 G3 receivers, which were controlled by means of an iPad app available for the PA system. A Sennheiser SR 300 IEM G3 transmitter was installed in the uppermost slot of the master speaker. Voice signals were supplied by SKM 500-935/965 G3 evolution handheld transmitters and SK 300/500 G3 bodypack transmitters. 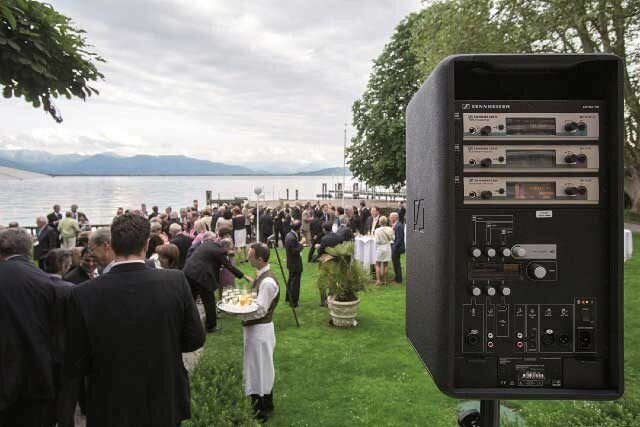 The powerful LSP 500 PRO was used, for example, to transmit the welcome speech for a reception in the park of the Hotel Bad Schachen: "The integrated tilt function enabled us to position the LSP 500 PRO on the high terrace and still be able to uniformly address the entire audience below – with a level of speech intelligibility that was simply amazing! ", said Mihály Baas. In addition to voice transmission, the loudspeakers were also used to transmit music. For the presentation of the Lindau Mediatheque, the sound was provided by a laptop. The attractive design of the new LSP 500 PRO PA system makes it a real eye-catcher. The speaker has an elegant appearance while still maintaining its practicality, with an impact-resistant polyurethane coating that prevents damage even under rough treatment. If required, the housing with its matt-black finish can be enclosed in a white stretch cover, and made-to-measure trolley bags are available for easy transportation. The mains cable, a weatherproof protective cover and other accessories are stored in a compartment at the top of the housing, which is also fitted with an ergonomically designed carrying handle. One loudspeaker weighs a mere 13.6 kg and have a pole mount for easy installation. Excellent sound is ensured by an 8" woofer and a ¾" driver operating on a horn with a dispersion pattern of 80 x 60 degrees. The frequency response extends from 65 Hz to 18 kHz (-10 dB). The two speakers are driven separately by Class D output stage modules with power outputs of 120 W (peak) and 55 W (continuous). Power can be supplied via a low-power mains cable, but most users will prefer to operate the LSP 500 PRO completely wirelessly, which is made possible by two integrated rechargeable batteries. These high-quality lithium ion batteries (Sennheiser LBA 500) are easy to remove from their slots and are "hot-swappable", which means that they can be replaced without interrupting the speaker's operation. As soon as one battery's state of charge becomes low, the second battery automatically takes over. The operating time using battery power varies according to how the LSP 500 PRO is being used. Fully charged batteries can provide up to eight hours of continuous operation before they need recharging. Batteries can be recharged externally using a standard charger for NP-1 rechargeable batteries. The equipment of the LSP 500 PRO includes an integrated 7-channel mixer that can process different signal types. Music can be input via two analogue cinch sockets. A mic/line input with switchable phantom power is also available at the rear of the speaker. Digital audio data can be input via a USB port, which, with suitable configuration, can also be used as a digital recording output for recording on a USB medium – a highly practical solution not only for recording conferences. Wireless music input is possible via Bluetooth (e.g. from a mobile telephone). WPA2 encryption is provided for WLAN operation. Three slots can be used to connect Sennheiser Mikroport transmitters (max. 1 of 3) and receivers (max. 3 of 3) in a 9.5" format. The mixer has integrated DSP algorithms including a compressor/limiter combination which can both shape the sound and prevent oversteering. A semi-parametric equaliser can be placed into all inputs and outputs. A useful feature is the possibility to delay output signals to compensate for signal runtimes in distributed loudspeaker set-ups. If the distributed loudspeakers cannot be connected wirelessly, they can be wired using the "Link Out" combined output. "Link Out" has a switchable low-pass filter to enable an external subwoofer to be connected as required without the need for further peripheral devices. A stereo Line output (2 x cinch) is also available. Particularly user-friendly control possibilities are provided by a clearly designed iPad app that can be used to control up to 20 loudspeakers – a genuine labour-saving device. Settings can be made either for individual speakers or for several loudspeakers at the same time. An app version for Android operating systems will be available shortly. A particularly practical feature: if network-capable Sennheiser transmitters/receivers, for example of the new 300 G3 series or higher, are installed in the slots, the operating states of the handheld and bodypack transmitters connected can be remotely monitored. Of course, the app also shows the state of charge of the individual speaker batteries. Even without an app, the LSP 500 PRO is extremely easy to operate. A high-contrast OLED display with a user-friendly menu structure and variable function assignment for the control elements on the display ensures optimum clarity for the control system. At the end of the conference, the motto of which has traditionally been "Educate. Inspire. Connect", Mihály Baas was more than satisfied with the new Sennheiser PA solution. "The LSP 500 PRO have a very high level of perceived quality – it is not only their appearance but also their 'touch and feel' when you are using them that is so impressive. Battery lifetime seems to be very good. We used the LSP 500 PRO the whole day long and operated them for about two hours without an external power supply. The battery indicator still showed 60 percent. Useful features are the separate digital display and easy access to the batteries for replacement. The sound is also good: the bass is powerful and the entire sound image is well-rounded. After using them at the 63rd Lindau Nobel Laureate Meeting, we can say that the LSP 500 PRO far exceeded our expectations!"